The Vagabond Glovers' Meanderings: Good Old Rocky Top? On our way north from Oak Ridge, we drive through Rocky Top, Tennessee, which until this moment we have only known through the lyrics of the classic Bluegrass sing-along song named for the town. The town is not so great as the song might lead you to believe. 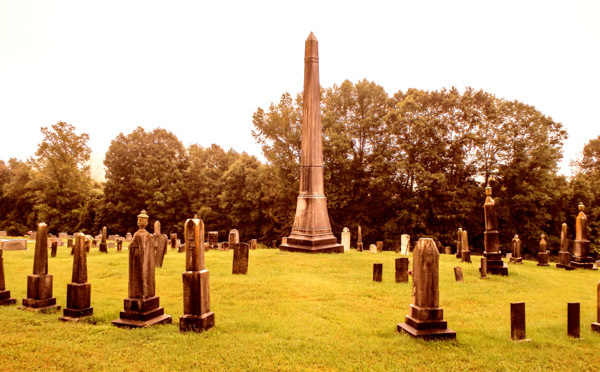 Our perceptions are highly influenced by the one stop we make in Rocky Top--at the Leach Cemetery, where, high on a hill, victims of the worst mining disaster in Tennessee’s history are buried in concentric circles around an obelisk commemorating the tragedy. 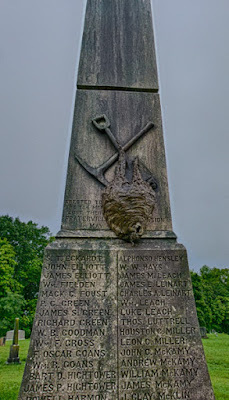 On May 19, 1902 a miner’s lamp ignited methane, causing an explosion in a mine in the nearby town of Fraterville, and 216 miners were killed. The town of Fraterville was suddenly left with only three men living--it became of city of widows supporting over 1,000 children. Other towns in the area suffered terrible losses, as well. It is raining as we walk up the hill to the monument listing the names of the 184 men they could identify from the catastrophe. The gravestones of 89 of them encircle the monument. As we get nearer to the central obelisk, we realize that a massive wasp’s nest is covering the coal shovel carved on the monument, and wasps are actively flying in and out. So, we never do get close enough to read those names, but we walk the circle of miner’s headstones-- so many, so young. Life in Rocky Top was not then--and is not now--so carefree as the song would have you believe.